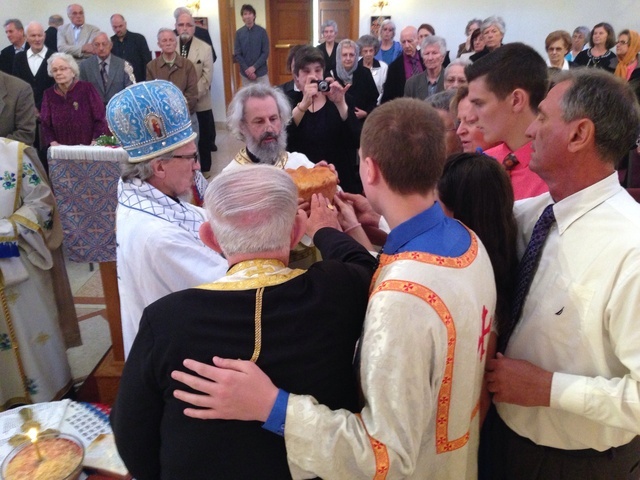 Sheffield Lake, OH - On Saturday, May 10, 2014 the St. Mark Monastery in Sheffield Lake, Ohio celebrated their Monastery Slava. His Grace Bishop Mitrophan of Eastern America and His Grace Bishop Sava retired bishop of Slavonia led the faithful in prayer at the Holy Hierarchical Divine Liturgy. Concelebrating clergy were V. Rev. Stavrophor Vasilije Sokolovic, V. Rev. Archimandrite Leontije (Alavanja), V. Rev. Stavrophor Djordje Mileusnic, V. Rev. Zivojin Jakovljevic, V. Rev. Mijoljub Matic, V. Rev. Milovan Katanic, Hieromonk Fr. Platon (Jovic) and Rev. Dragan Goronjic. Also serving was Protodeacon Ljubisa Mitrovic. In attendance was also V. Rev. Stavrophor Djuro Majerle. Also, Sister Anastasija from New Marcha Monastery attended. At the Little Entrance His Grace Bishop Mitrophan elevated Fr. Mioljub Matic to Protojerej and Deacon Ljubisa Mitrovic to Protodeacon. Kumovi for this year's celebration were Mr. and Mrs. Jovan and Angela Majerle. Following the liturgy the Sisters prepared a Slava banquet for all guests.